Rose Phillips did not know how to read -- "not really, not all the way." For more than 50 years she believed that was no big deal. Her mother had taught her to cook, sew and clean. Her husband handles the family finances. Growing up near Chicago, she knew her way around, and her job, "tidying up a big office building," does not require her to read. She even memorized all the words to songs she likes and how to play them on the piano. Her mind is "good that way." But then two years ago, Phillips went to her grandson's parent-teacher conference. Sitting in the little student chairs, listening to how her grandson was not making the grade in reading, did something to her "inside, real deep." She smiled at the young teacher and made promises about attending to the situation. She didn't know they were promises that would change her life. "The idea of him growing up without the right skills, without the knowledge of words, shot the fear of God into me," Phillips said. "Living without reading is like being in a maze," she explained. "You can get to the end if you try, but you get caught up in all kinds of twists and turns that make you feel like you're not worth much." She decided her grandson would "have the gift of reading." She also decided it was a gift she also deserved. In "a secret, that everyone knew but no one talked about," she began to be tutored by a woman teacher down the hall. While she is "no wizard" at reading, she can now read stories to her grandchildren -- and the report cards that show her grandson "may be getting the knack too." It was the challenge of overcoming a hurdle that seemed to grow higher with the years that spurred Phillips on during her lessons. It was love that made her want to make a difference in her own life and the futures of those for whom she cared. On a bigger stage, Phillips' drama is being acted out in thousands of churches, schools, community centers and homes throughout the United States. Last fall, President Bill Clinton issued a challenge to the country -- to ensure that all children can read independently by the end of third grade. The challenge is a formal one, with a title and $2.75 billion to back it up. The "America Reads Challenge" is banking on the premise that the people of this country will rise to face any adversity and address potential disaster, which is how the state of reading in America's schools is being seen by some experts. According to the U.S. Department of Education, in 1994, 40% of fourth-grade students failed to attain the basic level of reading on the National Assessment of Educational Progress. Seventy percent did not attain the proficient level. In 1996, it was reported that among U.S. third graders, more than 40% could not read independently. Studies show that if a student cannot read proficiently by the third grade, their potential to learn is severely diminished throughout the rest of their academic careers. Many educators blame the high U.S. high school drop-out rate of 29% (in Japan the rate is 5% in Russia it is 2%) to a lack of reading skills in students' early years. They also find significance in the fact that 86% of juvenile offenders in the criminal justice system have reading problems. These deficiencies are not isolated to disadvantaged students. Thirty-two percent of fourth graders whose parents graduated from college are reading at or below the basic level. Surprisingly, a significant percentage of the 90 million adults at the two lowest levels of literacy proficiency perceive themselves as reading or writing English "well" or "very well." Where is the standard? Why, when reading is universally recognized as the basis of all learning, are 35 million Americans reading at less than a fifth grade level? That's the challenge. "It's time to get serious. The dumbing down of American education must end," said Richard Riley, U.S. Secretary of Education. "If children need extra help to measure up, they should get it. Let's provide tutors, and call in the families, or keep the schools open late and open in summer, too, if we must. But whatever we do, let's end this tyranny of low expectations once and for all. Illiteracy is the ball and chain that ties us to poverty, and we must smash it forever." The America Reads Challenge has four components. Recruiting business leaders to work with their communities to improve schools through programs like the current"Read*Write*Now." Dec. 21, Clinton announced that 20 college presidents have pledged to dedicate half of their federal funded work-study slots to students willing to work as literacy tutors. He envisions a time in the near future when 100,000 college students will work their way through college teaching people to read. More than 11,000 AmeriCorps volunteers are also expected to help organize a national network of reading tutors. The most crucial element, now and always, is the attention children receive in the home, experts say. 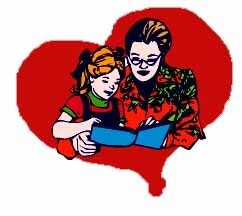 Numerous studies have demonstrated that parental involvement increases reading test scores and perhaps is "the most crucial influence" in a child's success in school. In the summer, for example, when children are not exposed to reading at home, they can average a loss of four months of reading gains made in the previous school year. Principals and teachers recommend that parents try to spend 30 minutes a day reading with their child. In today's increasingly technological society, educators say, the process of learning never ends. Without reading, individuals, society and the economy suffer. According to a Literacy at Work Study done by the Northeast-Midwest Institute and the Center for Regional Policy, business losses attributable to basic skill deficiencies run into hundreds of million of dollars because of low productivity, errors and accidents. In addition, 60% of those on U.S. Unemployment rolls lack the basic skills necessary to be trained for high tech jobs. "To achieve our full potential as a nation we must make sure everyone can read -- adults as well as children," President Clinton said in a December address. "Without literacy, the history books and job manuals are closed, . . . and the promise of America is much harder to reach." For Phillips, the cost is much more dear. "That's one of my babies," she said. "Why should he be denied the world because no one took the time to teach that child to read. I take the time. It's worth every precious second." Some Ways You Can Help Make a Difference.